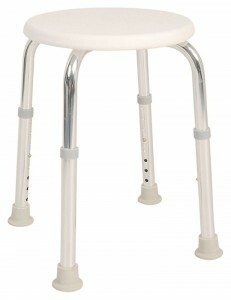 The Height adjustable round shower stool has a lightweight frame. It is an essential item to have in the wet room or bathroom at home. I have advanced MS and my balance and mobility are very poor. Now I must sit on a stool when I use the wash-hand basin as well as in the shower. I sit on it when cleaning my teeth, having a shave or brushing my hair. Bad balance is the reason why I need to sit down. I could very easily fall over. The height adjustable round shower stool has definitely improved my quality of life. Doing simple things in the bathroom is much easier sitting on the stool. It is very light, and it is easy to move. For me these are big plus points. Equally important it will not go rusty or corrode. It is delivered as a flat pack but it only takes a couple of minutes to assemble. It’s easy to adjust the height and the rubber feet make it very stable. so why not check out this height adjustable round shower stool now. Being able to sit down and take a shower has changed my life. Before I always had to keep my balance with the bathroom grips using one hand and wash myself with the other. Imagine how difficult it was just to keep my balance. That problem has now gone away. I can use it as a seat when I use the wash hand basin. It’s really useful if I get tired when standing on my feet and my balance is not very good. I said it was flat packed so it is very easy to pack in a suitcase when you are going to visit some friends who do not have a suitable stool in their bathroom. Just five Phillips screws to secure the adjustable legs to the seat. It makes my life easier and I think it is essential for people with bad balance or unable to stand on their feet for long. Buy the shower stool now.